Here's the beginning of the next generation of Disney kids. I'm a disney kid and come from a disney family. 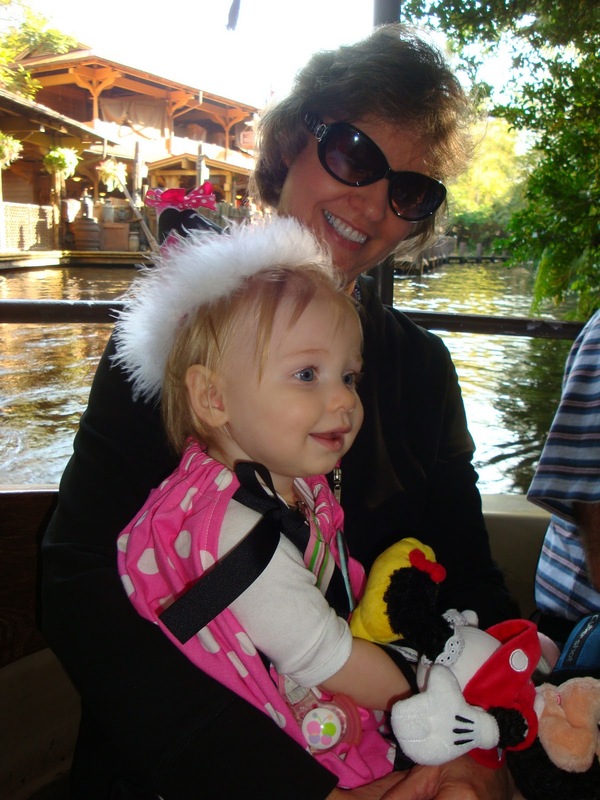 We are incredibly fortunate that our Aunt Sarah, my father's only sister, works for Disney. And growing up she would save her guest passes and use them when family came to town to take us to the park. Growing up I must have been to the park at least 10 times, but I think this time may have been my favorite. It was completely different going to the park with our child. We didn't run wildly from ride to ride and hop from park to park. Instead we became quite familiar with all the stroller parking areas of the park and spent our time riding those rides that we haven't been on since we were kids and actually waiting in line to meet characters. Funny thing, I asked my mom "did you enjoy spending the day with your first granddaughter in the park" to which she replied "not really". And she pointed out that having a baby at Disney is a lot of work and the right age is about 5 or 6 for a trip. I agree and we probably won't return until then. But for now, let's enjoy the memories of this trip. 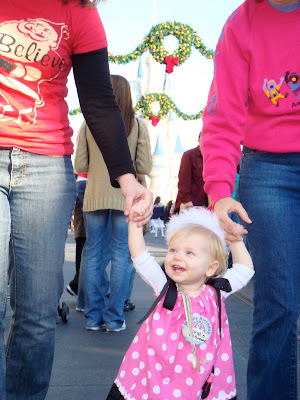 We started the morning with a walk down Main Street USA holding onto Natalie and Aunt Sarah's fingers as we went to the celebrations cart to get our Birthday and First Visit Buttons. Then we headed on over to Adventure Land to knock out some of our favorite attractions: the Jungle Cruise and Tiki Room. For those of you who don't know, the Jungle Cruise is a boat ride with a guide that tells horribly cheesy jokes. Our family philosophy is to make the cruise better for everyone by egging the guide on to tell worse jokes and adding our own to the mix. We like to play along with all the cast members to add to the Disney magic. But here's Sarah enjoying the ride with Grandma. Sarah also really liked the Tiki room, she lit up and waved her arms as the anamatronic birds came out of the ceiling and started singing. After that we rode on Aladdin's magic carpet ride. It's the same premise as Dumbo. Sarah loved it! She kept reaching forward to push the button to control the tilt of the carpet. Mom and Aunt Sarah sat in the carpet with us and snapped this picture. You can see Dad in the carpet behind us with Emily's friend Eli and in the next carpet is Auntie Em and Uncle David. After that it was time for the first of many diaper changes. Chris took Sarah and I noticed a small line forming outside of the ride. I asked what was about to happen and the cast member said Jasmine and Aladdin were about to arrive. So I thought what the heck. We waited about 5 minutes to meet them. And this was the moment of truth. I had hoped that Sarah would be walking by Disney so she could walk up to the characters and I wouldn't have to hold her in the all the pictures. She wasn't so I was worried about how the characters would be able to interact with her. I put her on the ground, and walked her towards them with her holding on to my fingers and they were just wonderful! Jasmine immediately put her hand out to help Sarah walk to her. 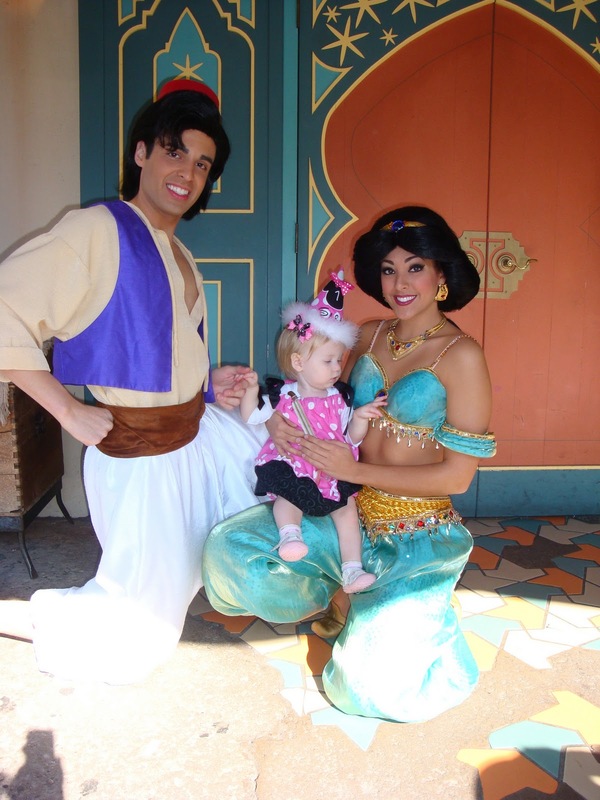 My child immediately started touching Jasmine inappropriately because she's attracted to bling. I apologized profusely but Jasmine just smiled and laughed and said it was fine. 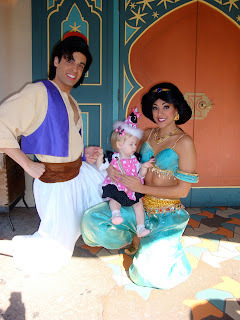 So here are Jasmine and Aladdin looking nicely at the camera for the picture, and my lovely daughter getting to second base. Awesome. We of course hit Pirates of the Caribbean next telling as many bad pirate jokes as possible. (I think it was only about a 5 or 10 minute wait for that so not bad!) And then ran over to the Haunted Mansion to pick up our ghostly hitch hiker. Sarah was fine on both of those rides which surprised me because I was worried about how dark they were. She's such a trooper. After that we went to ride Big Thunder Mountain and did the parent ride share. So while mom, dad, and Aunt Sarah waited and rode the roller coaster Chris and I walked around and Sarah took a nap in her stroller which is when we realized that a napping baby at the park sounds like a great idea but it actually stops us from getting to ride the rides. There were quite a few rides with under a 5 minute wait, including It's a Small World, but we didn't want to park the stroller and risk waking Sarah up as we took her out of it to ride anything. So we shopped for a bit before swapping out with the parents for our turn on Big Thunder Mountain. Then we rode Peter Pan's Flight and saw Gena Davis, from A League of Their Own while we waited. But after that was the highlight of the day for me. We bit the bullet and waited in the 40 minute line to meet the Princesses. So, since the princesses (and apparently fairies but we didn't wait to meet them) are so popular they can always be found in Toon Town. You wait in a line and they let you into a room with the ladies in groups to meet and greet. We happened to be the last people in our meet and greet group and it was amazing. First, the ladies that play the princesses are all just so incredibly nice! They seemed genuinely happy to meet our daughter and excited to hold her and help her walk. They called her by name (because it was on her dress and matching hat of course) and wished her a happy birthday. 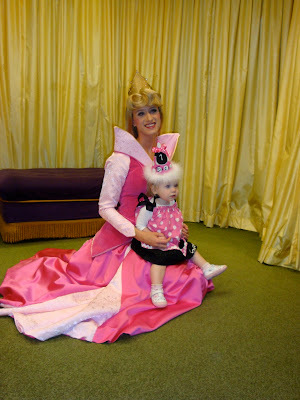 We met Sleeping Beauty first and she held her arms out to help Sarah walk over to her, sat down on the floor and brought her right into her lap. Then Sleeping Beauty held Sarah's fingers and helped her walk over to Cinderella. Who wouldn't you know doesn't have much bling! But Sarah still loved on her by petting her silky gloves. It was just wonderful how they talked to her and she looked up at them and listened and smiled. Then Cinderella helped Sarah walk to Belle who was already sitting on the ground with her arms out calling to Sarah and waiting to get to hold her. 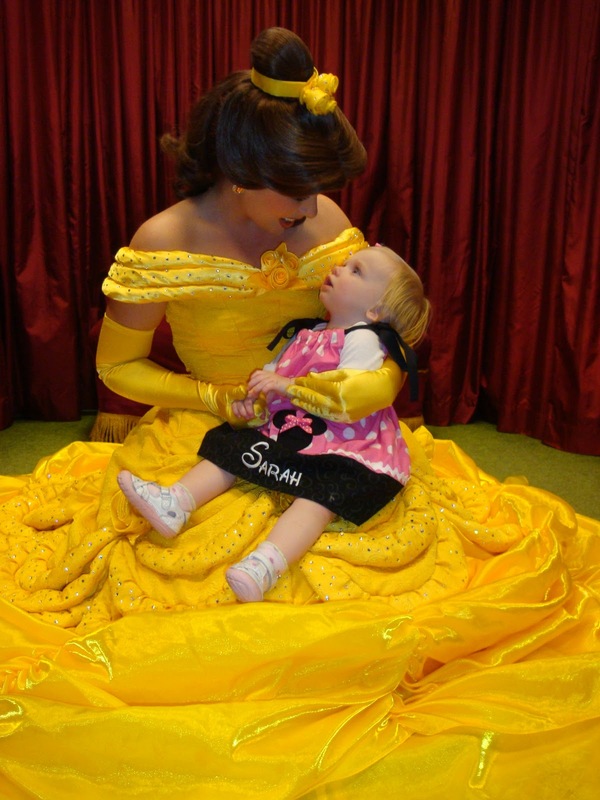 I think Sarah may have loved Belle the most. She petted her gloves and picked at the sparkles on her dress. We're all snapping pictures like mad trying to get Sarah to actually stop looking at Belle for one moment to look at the camera. 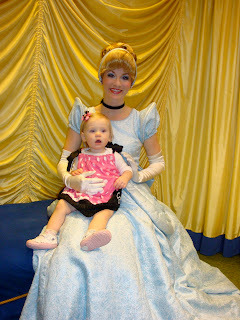 Then I think it was Cinderella who asked if she and Sleeping Beauty could join Belle for some group shots with Sarah! How cool is that! None of the other kids in this meet and greet session got a chance for group shots. I was just really, really impressed with how sweet and wonderful all the characters were with Sarah. I can only imagine how much she'll really love it when she's old enough to remember it! Oh, they even invited Aunt Sarah and I to join them in some of the pictures. So we walked around Toon Town for a while and visited Minnie's house and then Mickey's house before we waited in line the meet the Mouse. Mickey and Minnie were the last characters we were willing to stand in line to meet especially because I think my dad was going to hurt someone if we wasted any more time on this endeavor. What can I say, he's a roller coaster guy so we hit up the Barnstormer after that. Sarah was, as expected, terrified of them. You can see it was all hands on deck to keep her in place to snap a quick shot. But I rescued her after this and held her as we took the other pictures. She even lovingly held her Minnie doll in some of them. And by the end she was willing to give both of them a kiss on the nose before parting. What can I say, she'll like them more when she's 5. If you know me, you know Sarah has a strict routine. And by about 6:30 she had about had enough. We had time for one more ride so we hit Dumbo. She rode with Aunt Sarah but those pictures are on her camera, so here's the one that we staged with her Daddy. Then she blissfully passed out in her stroller allowing the adults to enjoy some more coasters. She woke up during the fireworks and wide eyed the 11:00pm Electric Parade as we ambled out of the park. Am I crazy for taking a 1 year old to Disney? Probably. But the opportunity was there and I wouldn't turn it down. Will I plan to do that for any other kids, no. But once again, it's all about the opportunities and seeing how I LOVE disney, I'll never turn down an chance to be in the happiest place on earth, especially now that I have children to share it with. Thanks Aunt Sarah for taking us, and mom and dad for helping make the day memorable. Glad you had fun! Happy Birthday, Sarah!!! Just reading your post made me tired. I actually teared up watching this! Not sure why, probably because I love Disney and think it's awesome that you took your 1st child to Disney! It was a special moment for me and looks like it was for you as well! And I don't think your crazy taking a 1 year old to Disney! I think it is fun at every age! You experience new things everytime and at every age! So glad y'all had fun!